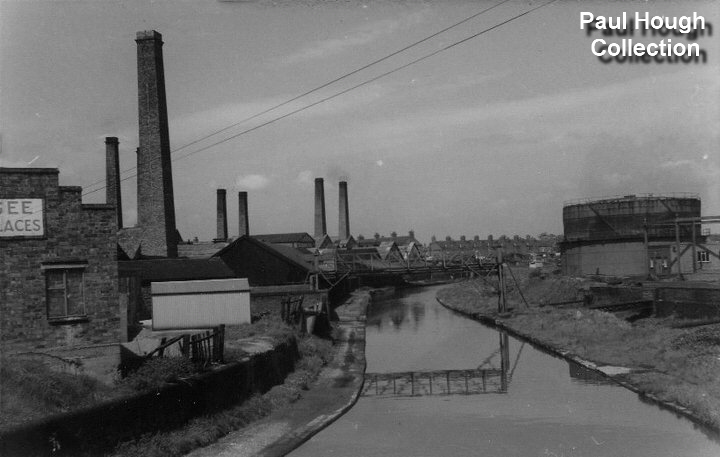 A familiar image to anyone who has studied the history of Middlewich and, in particular, the history of the local salt industry. This advertisement from C F Lawrence's celebrated History of Middlewich of 1895 has appeared in many articles, books and treatises on Middlewich and its connections with salt, not least because in 1967 Henry Seddon's works in Pepper Street was one of the last open pan works to close, along with the company's other works in Wych House Lane and Brooks Lane. By that time, all three of the Seddon's works were owned by Cerebos Salt Ltd.
Seddon's Salt Works in Pepper Street in the 1960s. Middlewich's gas works is to the right. But over the years we've all become so used to seeing black and white versions of this advertisement that is may come of as a bit of a surprise to see that the original carried a little bit of what is now called 'spot colour' when first published. Who knew that in the original book, those ornate Victorian borders were coloured red? The only other colour on the page is caused by the ageing of the paper. In 1895, of course, it would have been as white as the salt it was advertising. It's tempting to think that salt is just salt. That fine, free running stuff that you sprinkle on your chips and might easily mistake for sugar. But, actually there are many different types of salt and they all have different uses. This was as true in the open-pan era as it is today. 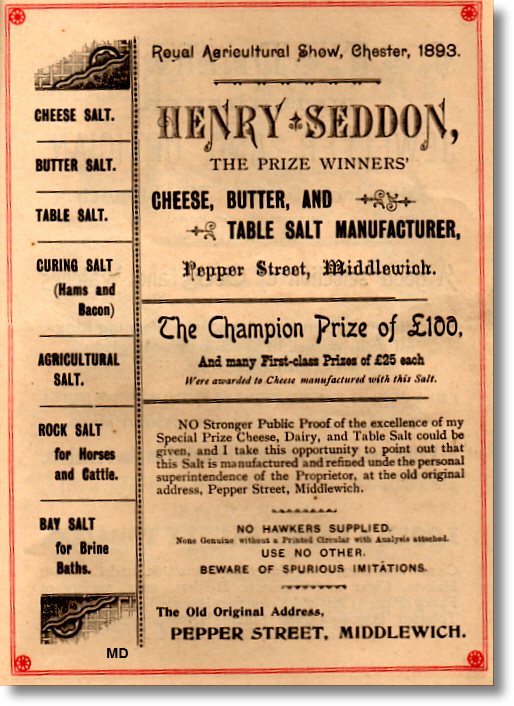 This is why Henry Seddon's advertisement talks of 'Cheese Salt', 'Butter Salt', 'Curing Salt (for hams and bacons)' 'Table Salt', 'Agricultural Salt', 'Rock Salt' and 'Bay Salt'- many of them reminders of Middlewich's position in the very centre of the largely agricultural county of Cheshire. Rock Salt, of course, is mined rather than produced from brine, and would, presumably, be bought in by Seddon's either from Northwich or Winsford. Bay Salt, which is usually produced from sea water, may well have been produced by Seddon's at Pepper Street. They had a large open air pan which, with a very low fire underneath it, may have used the action of sunlight during the balmy Middlewich summers to produce this soft 'bath salt'. You'll note that Henry Seddon claims that Pepper Street salt was 'manufactured under the personal superintendence of the Proprietor, at the old original address, Pepper Street, Middlewich'. Victorian hyperbole, of course, which sits nicely alongside the usual exhortions to 'Use No Other' and to 'Beware Of Spurious Imitations'. As for that 'old, original address': as we've said before, we can only assume that the salt works found itself in Pepper Street because someone in the local administration of the time had a sense of humour when it came to coming up with street names. *One of the very first articles I wrote for the Middlewich Heritage Society back in the 1980s was based on an interview with Joe Clarke who had worked in the open pan salt industry for many years. He told me that workers in the industry were under strict instructions not to tell the public about the often strange and potentially off-putting additives used to produce different types of salt.